IN 1968, when Christopher Browning was a doctoral student at the University of Wisconsin, he proposed a dissertation topic centering on the Nazi era. His advisor responded with mixed advice: "This would make a great dissertation, but you know there's no academic future in researching the Holocaust." SO Browning finally comes round to the solution that I first proposed in Hitler's War in 1977 -- that Hitler was largely in the dark about what is now called the Holocaust, and certainly issued no order for the systematic extermination of the Jews. That being so, it may seem remarkable --- leaving the hefty fee out of consideration for a moment -- that he agreed to act as an expert witness for Prof Deborah Lipstadt against me in the British High Court libel trial in 2000. What his academic advisor, referred to in the first paragraph, meant of course has been missed by the journalist interviewing Browning: the advisor's real warning was, "Doing objective research on the Holocaust would be academic suicide." The Madagascar Plan was not aborted in the summer of 1940; Hitler was still referirng to it as a likely outcome in his table talk in July 1942. That was six clear months after the Wannsee Conference, where -- so conformist wisdom has it -- Hitler's decision to exterminate was announced. Less than a decade later, the Holocaust was being studied at universities around the world, and Browning found himself at the forefront of a new academic field. So respected was his work that, in the 1980s, he was approached by Israel's Holocaust museum, Yad Vashem, about working on a project. The museum had received funding to print a multivolume series about the Nazi era, each book summarizing the experiences of Jews in a different region of Europe. The project also called for three volumes that would trace the Nazis' development of the Final Solution. None of the Israeli researchers involved were eager to explore the topic from the side of the perpetrators, so the task fell to a group of non-Jewish academics, each of whom would write on a different few-year period, tracing the key decisions that gave rise to the Holocaust. Too often, these policies and this period have been seen through a perspective influenced, indeed distorted and overwhelmed, by the catastrophe that followed. The policy of Jewish expulsion ... was for many years not taken as seriously by historians as it had been by the Nazis themselves. As late as the spring of 1940, Nazi leaders dismissed the idea of mass murder in favor of relocating the Jews to a colony in Africa. "This method [of deportation] is still the mildest and best," wrote Gestapo Chief Heinrich Himmler in May of that year, "if one rejects the Bolshevik method of physical extermination of a people out of inner conviction as un-German and impossible." The so-called Madagascar Plan was aborted when Germany lost the Battle of Britain later in 1940. Browning presents the "gas van," introduced in 1939 to kill the mentally ill, as the first significant step toward Nazi extermination camps. Based on the theory of eugenics, an offshoot of nineteenth-century Darwinist thought, the Nazis formulated a program in which euthanasia was used to remove those they deemed genetically weak. They developed a system wherein a van disguised with the label "Kaiser's Coffee Company" was driven through the countryside, loaded up with mental patients, pumped full of carbon monoxide, and driven to remote areas for forest burials. During the following years, gassing would be introduced for targeted and later mass killings at concentration camps. no further escalation in the process was conceivable. It implied the physical elimination of all Jews, irrespective of gender, age, occupation, or behavior, and led directly to the destruction of entire communities and the "de-Jewification" of vast areas. The question was no longer why the Jews should be killed, but why they should not be killed. In leading the reader from the Nazis' early deportation of Jews to the launch of the extermination program in 1942, Browning's book does not seek a single grand theory behind the Final Solution. Instead, Browning focuses on the series of contingencies and decisions that brought the Germans increment by increment to such an extreme. The result is a vision of evil whose origins are not otherworldly but unnervingly human. Browning currently resides in Chapel Hill, where he is the Frank Porter Graham Professor of History at the University of North Carolina. I spoke with him by telephone on February 3, 2004. One point you emphasize throughout the book is the need to look at history stage by stage, without taking into account what we know now. Why do you feel it is important to consider the deportation of Jews as a phase unto itself rather than as a stepping stone to extermination? The initial or easy tendency in looking at history is to see it through hindsight. We know ultimately what happened, and therefore we go back and look at all the steps that led to it happening but remove all the contingencies. We're very well aware at this moment that we can't predict the future. But we go back and somehow assume that we can impose a deterministic interpretation on the past because of what we know from hindsight. In doing that, we remove the fact that living historical actors at that time, certainly in 1939 to 1941, didn't yet know what was going to happen -- neither the victims nor the perpetrators. And we cannot understand the decisions they made unless we understand how they perceived the world they were living in and the choices that they were facing. We know that Jewish leaders made certain choices because they couldn't even conceive of a program of systematic mass extermination awaiting them. Also important is that the Nazis made decisions at this point. They had various choices. The goal of this book is to show where those different turning points were, where people came to forks in the road and went one way instead of another. This is essential to understanding not just what happened in the end but how it happened. What was the step-by-step path that led from the conquest of Poland in 1939 to the opening of the death camps in 1942? You begin the book by reviewing the historical events that set up the conditions for the Holocaust in Germany. One of these was, as you put it, "a distorted and incomplete embrace of the Enlightenment." Can you elaborate on this? In Germany, after the Napoleonic conquest, the values of the Enlightenment were spread in an uneven way. What I call the humanistic and individualistic side of the Enlightenment was generally associated with the French, and in order to break away from Napoleon, the Germans embraced the scientific and rational side of the Enlightenment. You have this kind of schizophrenia where Germany absorbed those aspects of the Enlightenment that gave them the power to drive the French out but shunned those parts that they considered contrary to German values. So a certain strand of German culture rejected such aspects of the Enlightenment as individual rights and a more liberal, democratic political tradition, while embracing the notion of rational, bureaucratic management of society. That's what I mean by a kind of unequal or asymmetrical embrace of the Enlightenment, at least within one part of German culture. At the same time as Jews were beginning to be deported from villages in the East, you explain that the Nazis were working to resettle groups of ethnic Germans. These were people of German ancestry whose families had lived in Eastern Europe for generations, and who still lived in German-speaking communities. How were those two initiatives connected? What's key is that the Nazis had a vision that their new empire in the East would be somewhat different from many of the overseas empires that other European nations had constructed. This wasn't going to be an empire in which you would have a thin layer of Germans ruling over a foreign native population like, for instance, the British administration in India. Rather, going along with the Nazis' very basic racial concepts, if the land didn't belong to Germany -- if it wasn't part of German Lebensraum, settled entirely by people of German blood -- it therefore would be only an annexation of the territories of Western Poland. This required the expulsion of all Poles, Jews, Gypsies -- all the "undesired" population. The Germans then had to resettle the area. And the way to find German blood to do this was to bring back -- they used the term "repatriation" -- the ethnic Germans living in the areas that were being conceded to Stalin by the Non-Aggression Pact: the Baltic Germans, the Ukrainian Germans. So these people were brought over and placed in refugee camps and then settled on evacuated Polish farms. There is something very interesting in this regard. There's a strong notion that one of the crimes against Germany that has not been given enough attention is the terrible ethnic cleansing of Germans from Eastern Europe at the end of World War II. It's true that hundreds of thousands of people died in expulsions from Sudetenland, Poland, and elsewhere. This aspect of German suffering has not been given enough attention. But neglected in all of that, I believe, is the reality that the first destruction of ethnic German communities in Eastern Europe was not done by the victorious Red Army, by the Czechs or the Poles, but by Himmler. He was the one who uprooted the ethnic Germans from the Baltic and the Ukraine. Very clear in all this was that in Nazi ideology, individuals had no choice about where they wanted to live. They were part of a blood community, and they belonged to the German race. Hitler and Himmler would dispose of them as they chose. They could be picked up and moved around and placed wherever it suited the Nazi regime. When we think of the Jewish ghettos set up by the Nazis in Poland, we usually envision harsh ghetto managers who tormented and starved the residents. You argue that this wasn't necessarily the case, that many ghetto managers wanted the Jews to stay healthy so they could be productive workers. What evidence did you find to suggest that? The evidence is in the documents. As I explain in the book, there were two groups that I call the attritionists and the productionists. There certainly were some who wanted to see the disappearance of the Jewish population through deliberate starvation. But a greater number of the ghetto managers wanted to maximize the productivity of the ghettos for the sake of the German war economy. A large part of this was driven by a desire for personal gain. The German presence in the East was extremely corrupt, and these men saw financial opportunities for themselves in the ghettos. And at the same time, they saw the problem of spreading diseases and epidemics. Typhus, after all, could not be contained by ghetto walls. So it was not in the best interests of the ghetto managers to create a sick and starving Jewish population. That ended up happening because the Jews were always given last priority, only provided for after the needs of other surrounding communities had been addressed. And there were not enough materials or provisions to go around. When you discuss eugenics, a philosophy the Nazis used to justify their killing of the mentally ill, you briefly mention that this movement had a strong following in some American states around that same time. Do you think the U.S. might have started on a similar track if the Nazis hadn't taken the idea to its farthest extreme? Well, the goal of the eugenics movement in the United States was not murder -- "euthanasia," as the Germans called it -- but sterilization. And it never had any explicit racial component as it did in Germany. There was, however, the initiative to sterilize low-income people with large families, and that ended up impacting the black population more than the white. Of course, that whole movement in America and around the world was discredited after eugenics became associated with Nazi policy. When the Nazis began to move into the Soviet Union, they incited German officials to violence by linking Jews with the Bolshevist threat. You say that the Nazis drew on old anti-Jewish stereotypes to do this -- the idea of Jewish people as a foreign, eastern race and communism as a sinister Asiatic ideology. But the Nazis also propagated the idea that Jews were money-hungry capitalists. How were they able to paint the Jew as both archetypal communist and greedy capitalist without worrying about self-contradiction? Certainly the two Hitler accusations -- the old Medieval stereotype that the Jews were the capitalist parasites, the moneysuckers, and the newer stereotype of Jews as revolutionary Bolshevik subversives -- are quite contradictory. The Jew can't be both the capitalist and the communist at one and the same time. But to square that circle, one can resort to conspiracy theory. This is, of course, what the Nazis did -- they said that behind these two different assaults on Germany, by the capitalist Jews on the one hand and the communist Jews on the other, was an insidious Jewish conspiracy that was coming to attack in all forms. Conspiracy theory reconciles what would be, on the surface, two incompatible pieces of evidence. And of course, conspiracy theory is infinitely elastic. No matter what contradiction you come to, if you go one step further back and imagine something else behind that, you can reconcile almost any kind of conflicting evidence. That is what the Nazis did. They had what I call "chimeric anti-Semitism," a fantasy in their own minds. But it became acceptable to many others because it touched upon so many long-embedded anti-Semitic stereotypes that, in one way or another, were accepted by large numbers of people in Europe. For Hitler himself, all of this came together in this fantasized world conspiracy. In some of the letters you quote, written by German officials in the East to their wives back home, there's a claim that the Bolshevist Jews were going to murder German women and children if they weren't killed first. Do you think these men genuinely believed this? Most genocides are conceived by their perpetrators as actions of self defense: "We must do this now because, if we don't, they will do it to our women and our children later." Mass murder is then justified as a preventive measure. I think this is just part of the mentality that makes genocide possible. First you divide people between "us" and "them." Then you cast the other -- "them" -- as a terrible threat. In turn, you justify your doing terrible things to "them" as self defense. You describe August 15, 1941, as "a caesura in the history of the Holocaust." What sets this date apart? My argument is that the transition from what I would call a kind of vague, unformulated vision of homicide in the future to the Final Solution -- that is, a coherent program to murder every last Jewish man, woman, and child in Europe -- took place in two stages; first for the Soviet Union and then for the rest of Europe. The Nazis may have come into the Soviet Union in June and July of 1941 under the assumption that, in some way, there would be no Jews left -- through some unspecified mixture of starvation, shooting, and expulsion and on some unspecified timetable. By mid-August, we have evidence that this had evolved into a very clear notion that the Jews would all be killed very quickly. The reason I say August 15 is because we have a report from one of the killing squads, the Einsatz Commando III in Lithuania, that breaks down the actual body count day by day, with victims listed by categories of communist or Jew. And within the category of Jew, they break it down by both age and gender. We know when they were shooting men, women, and children, and in what proportions. What is clear is that up until mid-August, they were following a pattern of shooting adult male Jewish leadership and Jews associated with the Communist military danger. Then, on August 15, the proportions changed drastically, and the major victims became Jewish women and children. This was a retargeting. When they started to give priority to killing women and children, this was no longer a selective murder of potential enemy male Jews but a program to wipe out the Jewish race in its entirety. I think this was in fact a transition that took place in different places over a longer period of time. But August 15, 1941, is the one date we can pinpoint very precisely for Einsatz Commando III. I was interested by a statement from a Nazi official stationed in Minsk about the deportation of the Reich Jews, those from German cities like Hamburg and Berlin. In contrast with the Jews of Eastern Europe, the official described the Reich Jews as "human beings who come from our cultural sphere" and was troubled by the idea of exterminating them. In general, do you think many Nazi officials found the killing of the Reich Jews harder to stomach? The Nazis assumed that, under the guise of this anti-Communist crusade in Russia, they could kill Soviet Jews without any real problems on the home front. But when it came to murdering German Jews, they had to be much more sensitive. I think they were worried that there might be a public-relations problem if word got out of their massacring German Jews. The letter from the Minsk official is evidence of this, and we see other cases, too. When the first trainloads of Jews were murdered in Kovno and Riga, rumors came back to Germany and some people were upset. Himmler was certainly aware that there would be a qualitative difference in the indifference or acceptance of murdering Russian Jews as opposed to German Jews. Thus, after the first six trains of German Jews were murdered in late November and early December, that program was suspended for a while. The Jews deported in the spring of 1942 were initially sent to ghettos in Poland -- in a sense "put on ice" for a while -- and then sent on to death camps later. In the same way, Jews, particularly elderly ones, were sent to Theresienstadt first and then sent on to Auschwitz. Your conclusion goes into a discussion of Hitler's role in the Final Solution. You emphasize that Hitler's enthusiasm brought together all kinds of people -- eugenists who wanted to achieve racial purity, technicians who wanted to display their skills, political careerists who wanted to get ahead. But you also point out that many of the specific ideas and plans did not come from Hitler but from his subordinates, who took their cues from Hitler's vague statements. 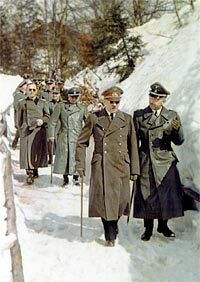 Do you think those second-level Nazi leaders like Himmler should be held as responsible as Hitler for the Holocaust? It's true that Hitler did not have to be a micromanager in this. He was able to make exhortations, give prophetic speeches. It was embedded in the Nazi system that the duty or imperative on all loyal Nazis was, in their own terms, to "work towards the Fuehrer," to always anticipate and support him, in a sense devote your life to him. When he made a prophecy, your obligation was to make that prophecy come true. When he staked out something in terms of a vague goal, your job was to make that concrete. This elicited all sorts of initiatives, all sorts of plans. Those were brought to Hitler. Sometimes he said, "No, you didn't read me right." Sometimes he put up a red light. Sometimes he flashed a yellow light -- "not ready yet" -- and sometimes he shone a green light and gave approval to go ahead. The person who read Hitler the best in this regard was Himmler. He was the one who could usually anticipate what Hitler wanted and understand what Hitler meant. This was why the SS gained in power so rapidly in this period, because as Himmler was leading them, he became increasingly indispensable to Hitler in terms of turning prophecies into realities. For a historian, this form of decision-making is maddeningly imprecise. You can't go to a single document or a single meeting and say, "Here is where something was decided." There is a stretched out stage of Hitler giving vague signals, others reading those signals, they coming to Hitler, he affirming they had understood him well, they going back and making plans and then bringing those back. So the decision-making process can go on over months, during which time there is not one single day or document we can pinpoint and say, "This is when it happened." Could there have been a scenario in which Hitler might have gone around making sweeping, vague proclamations but no one would have come forward to make those concrete? Among the many different people who were "working towards the Fuehrer," there were some very committed ideologues, very committed anti-Semites. Some of them were pressing Hitler before he was ready. He was not only giving green lights but giving red lights, at times saying, "No, this is premature." The way this worked, even if a Himmler or [Reinhard] Heydrich had not come forward with various proposals, it's almost inevitable that someone else would have. Himmler or Heydrich may have distinguished themselves by being the first there, but they certainly weren't the only ones. There were enough people vying for Hitler's favor in all of this that, even if those two had not been there, I think the process would have tended in that direction in any case. Others would have filled the void. In terms of Hitler giving the "green light," you say this often coincided with a big Nazi victory. The more success Hitler experienced in his campaign, the more daring he became with implementing his plans. I argue for a very stark correlation between the victory euphoria that Hitler experienced -- in September 1939, May and June 1940, July 1941, and late September and early October of 1941 -- with what I consider the four pivotal points of radicalization of Nazi Jewish policy. I hypothesize that one of the factors influential with Hitler -- one of the reasons he gave green lights -- was the big boost he got from the sense that Europe was now at his feet, that previous restraints had fallen away. He felt he could be more uninhibited, that he could give greater rein to turning his fantasies into reality. Therefore, Nazi victories were an accelerating factor, a factor conducive to the intensification of racial persecution. This book goes into the minutest details about the unfolding of the Final Solution, focusing on everything from the train schedules to the different kinds of gas tested by the Nazi technicians. What is the value of quantifying evil in this way, breaking it down into small details rather than only looking at the bigger picture? It's always easy to identify the Holocaust with Hitler, which is certainly not wrong. He was, as I argue, the prime decision maker and instigator in this. But if we want a fuller picture of how these things came about, then we need to get at the layered, complex reality in which all sorts of people made incremental contributions. It's important to see the impulses toward the Final Solution as having come not only from Hitler from above but from many other people below. We may, in the end, conclude that the Holocaust has very unique characteristics among genocides. But to be unique in some ways is not to be unique in all ways. The various perpetrators who became involved in the Final Solution and their decision-making processes were not unique. In fact, I would argue that many of the elements in this were a coming together of quite common factors and ordinary people. That, I think, is very important to recognize if we don't want to place the Holocaust apart as some kind of suprahistorical, mystical event that we cannot fathom and shouldn't even try to understand.